Personalized Items Make Great Gifts! Shop our huge selection of personalized gifts for loved ones, friends, and coworkers. Gifts to suit all occupations, hobbies, and likes! Huge selection of personalized gifts for sports, hobbies, and interests. We have partnered with Zazzle to expand our product line! If you can imagine it they can put our art on it! We have paired our personalized Friendly Folks cartoon caricatures with a variety of gift items; creating lifelong, treasured keepsakes, one gift giving occasion at a time. 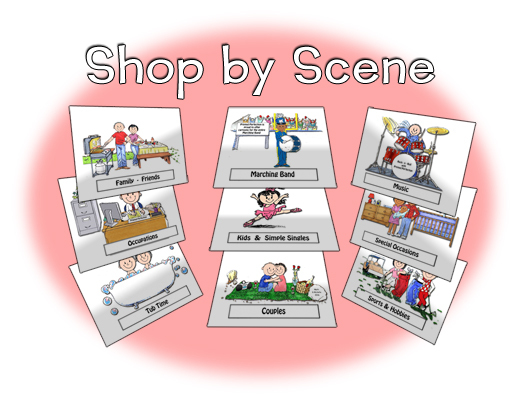 Offering more than 600 fully personalized cartoon scenes, Printed Perfection has something for everyone, whether you are shopping for your mother, father, brother, sister, neighbor, co-worker, boss or yourself. Best of all, aside from getting quality items, that are shipped fast, most of our gifts are under $20 - making our Friendly Folks caricature gifts perfect for everyone, even that hard-to-buy-for person on your list. Ordering is easy! Simply browse our categories to find your perfect Friendly Folks cartoon scene. Remember, that many of our cartoons can be used for a variety of purposes, so if you do not see a scene or character that you are looking for, try using our search function or contact us. We are happy to help! 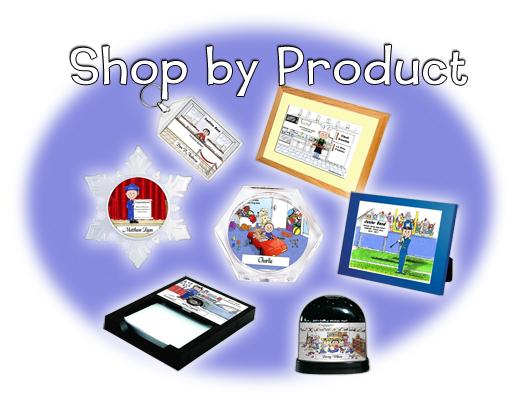 Click on the caricature scene that you like, and you will be brought to a page that will display a variety of gift items that you can personalize and purchase. Currently all scenes are available in a snow globe, snow frame, print with mat, print with mat and frame, key chain, Christmas ornament, drink coaster, desk accessories such as memo pad holders and mail sorters, refrigerator and filing cabinet magnets and as a download. Printed Perfection is proud of our Friendly Folks cartoons, and we take pride in personalizing each and every order to perfection, maintaining quality while providing fast shipping. We provide a full satisfaction guarantee on all our products, which has made us a leader in personalized gifts. I just wanted to follow up and let you know that everyone just LOVES their snow globes! All the printing was correct and they looked great. They made such an impact; I've had 2 people ask where I bought them. They are coming up with all sorts of occasions to buy personalized items from you! Of course, I passed on your information, and let them know how professional and courteous you were. Thanks again for everything you did to make sure I received my orders in a timely fashion, while ensuring every single item looked fantastic. Have a very Merry Christmas, Jeanne! I will definitely be a repeat customer. I wish you and your company continued success in 2017. I cannot believe you went to so much trouble for one little order and am sooo impressed. I looked at your image and LOVE it, and it actually looks so much like my little granddaughter. You are the best! Boy, is this company ever lucky to have you working for them!